Our first roast near The Cotswolds! We were travelling back from visiting family near Wales, and we just had to take advantage of reviewing somewhere new. Whilst driving along the A40 towards London, I saw a sign for The Fox Inn up ahead. As it was just after 12:30, it was perfect timing! We drove down a country road, through a stone cottage village towards the river. 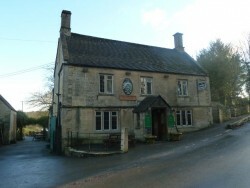 The Fox Inn was on the left hand side. The car park was pretty full, so I was quite hopeful with the Sunday lunch. I walked around the back initially, seeing the river and a flock of ducks being fed by some children. The outside space is very generous, with various seating areas and a barbeque sign for warmer weather. Finding a door, I entered the building and the restaurant. It was quite busy with the various Christmas lunches, but they had space for Claire and me if we wanted to dine in there, or we could try the pub. Turning round and walking through a couple of short hallways, I found the pub. Upon entering, I could feel the cosiness. A log burning stove on one side of the room, a large Christmas tree (with the top ever-so-slightly bent due to the size and ceiling) – yep, Claire and I will eat here! They had some warming, traditional drinks on offer, Claire went for a mulled wine (£4.50), I decided on the apple and cinnamon (£2.75). The barman said he’ll bring them over. 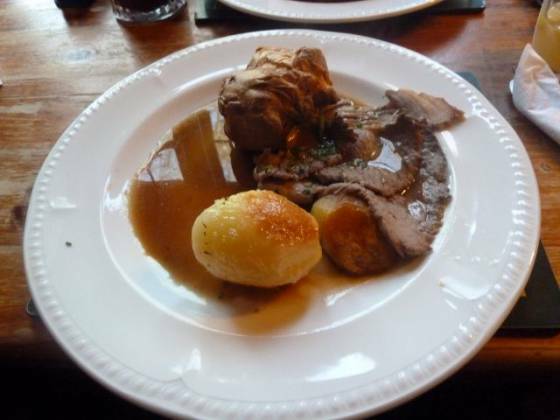 The Sunday lunches were printed out and stuck on the wall (a bit unusual, I would have much preferred a menu to hold). 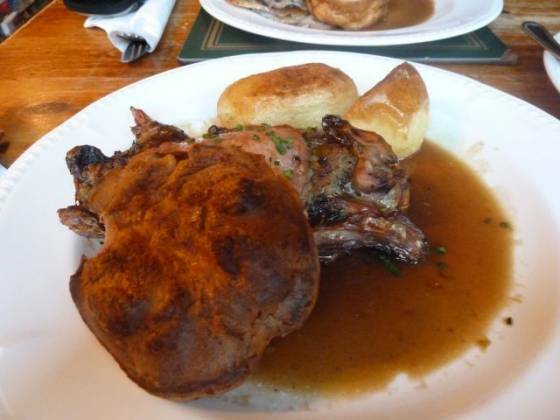 Claire was undecided on either the Roast Pork Belly or the Roast Pheasant (she settled on the pheasant in the end). I went straight for the Roast Beef. About 10-15 minutes later, our roast dinner had arrived. 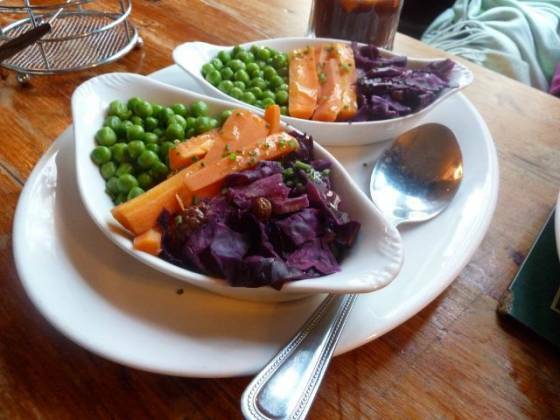 We each had a plate with meat and potatoes, with a separate dish each for vegetables – consisting of carrots, peas and red cabbage. I had 2 large slices of beef, it was cooked through. It was nice enough, but I would have preferred it being pink in the middle. This was the first time Claire has had pheasant, so it’s difficult to say whether this was atypical or not. She said the (sausage meat?) stuffing was very nice, but the bird was very tough. Not something she would order again. My potatoes were a bit on the small side, only two were provided and one of them was more just oily instead of crunchy. Claire kindly gave up one of her’s, which was so much better. A very nice size, crunchy on top and a good consistency inside. The carrot batons and peas were ok. The red cabbage had raisins, I normally avoid red cabbage like the plague but I found this one too tempting – it was good. As Christmas was round the corner, and I have already had my fill of numerous desserts and sweet things, I decided to break from recent tradition and forego dessert. As Claire also wasn’t in the mood for pudding, we were able to leave swiftly after our Roast dinner.